Τhe company participates in the organization of one of the biggest technology events in Greece, Digital Expo, which in 2018 gathered around 17,000 visitors. 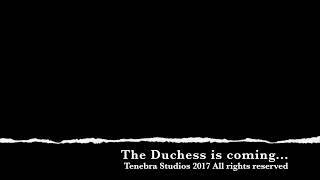 Currently, Tenebra Studios is in the process of developing the first Greek virtual reality (VR) game, titled ‘Duchess of Plaisance’ and based on a true story. The game will be released on PC and mobile. Tenebra Studios collaborates with the Municipality of Penteli and the Palace of Doukissis Plakentias, as well as the Byzantine and Christian Museum, one of the many palaces of the Duchess. For this game, the company works closely with New York College Computer Science Department and New York College Psychology Department, the Department of Communication, Media and Culture of Panteion University, as well as the University of Bolton. 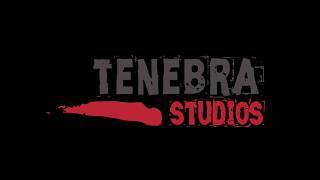 Bloody Hellas is also a strategic partner of Tenebra Studios in the development of the game. Dungeons 'n' Disco is an FPS Dungeon crawler currently under development by Tenebra Studios. 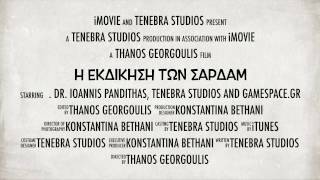 Tenebra Studios, a game development and localization company, was founded in 2006 by Thanos Georgoulis and Konstantina Bethani in Athens, Greece. Since then, it has maintained a solid partnership with Sony Hellas, Sony Norway and Sony Portugal. 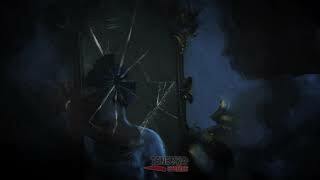 Specifically, the company participated in the translations of Uncharted 3 and 4, The Last of Us and God of War 3. Tenebra Studios also has years of collaboration with Huawei and Xiaomi, developing custom-made games for their appstores in China. The company has also developed educational games for Abbott Diabetes Care Hellas as well as for New York College educational group, while developing interactive advertising applicationsfor Attiki Honey SA, Velvita and other companies. In addition to video games, the company has developed mobile and desktop applications, while providing QnA, beta-testing, off-site programming and R & D for Warner Bros. Interactive Entertainment, Firaxis, Blizzard Entertainment. Tenebra Studios also participates in the organization of one of the largest technology events in Greece, Digital Expo, which in 2017 gathered around 14,000 visitors, while in 2018 it surpassed 17,000 visitors. As part of Digital Expo 2018, Tenebra Studios successfully organized the Startup Awards for the start-up Greek businesses that participated in the event. In addition to the games they develop, Thanos Georgoulis and Konstantina Bethani are Professors at the Game Development courseof New York College educational group and have a track record of research projects. In collaboration with the University of Bolton, they have validated the Games Programming with Foundation Program at Bachelor level for New York College. 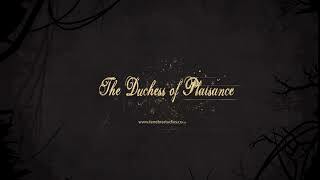 Currently, the company is in the process of developing the first Greek VR Horror game titled ''The Duchess of Plaisance" (DoP). The game, based on a true story, will be released for Google VR. Tenebra Studios collaborates with the Municipality of Penteli and the Friends Association of the Duchess of Plaisance' Mansion in Penteli, as well as the Byzantine and Christian Museum, one of the many mansions of the Duchess, for the accurate representation of the era. For this game, Tenebra Studios also collaborates with the New York College Computer Science Department, with which the company exchanges know-how, as well as the New York College and the University of Bolton Departments of Psychology. The Department of Communication, Media and Culture of the Panteion University, the National Technical University of Athens and the Embassy of Lebanon have been valuable partners in the development of the game. The aforementioned game already enjoys great recognition and appreciation from the Greek public. 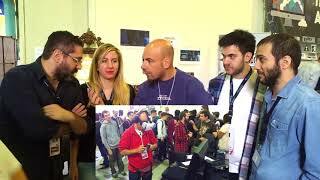 In 2016 it was presented at Digital Universe # 3, at the organisation of which the company participated, at the Thessaloniki International Fair and GameAthlon 2.5 where it received extraordinary reviews. In 2017 it had the same response to Athens Science Festival, Athens Mini Maker Faire and Digital Expo 2017. The 'Duchess of Plaisance' won the first prize in the Indie Awards competition held in the premises of Digital Expo 2018. In addition, Pan-Hellenic TV stations, Pan-Hellenic newspapers, domestic and international magazines and sites have made special tributes repeatedly to the company and the game itself, given the quality of the game as well as the unprecedented theme and historical period in which it takes place. More can be found on the attached Tenebra Studios’ Press Kit. The technology developed in the "Duchess of Plaisance" is also a world first, hence one of the world's giants of technology, Sony, seeks an exclusive collaboration with the company in order to publish the game on Playstation 4. The game is one of the world's most innovative, using machine learning technology that learns the player's fears and habits and uses them against the player. 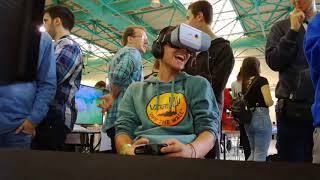 Moreover, the game implements custom technology produced by Tenebra Studios that does not cause VR motion sickness to the user even after extensive periods of gameplay, tested in multiple events and conventions were the company has showcased the game. Συνέντευξη στο Video Gamer Greece για το Σεμινάριο δημιουργίας video games από την Tenebra Studios"
Συνέντευξη για τη «Δούκισσα της Πλακεντίας» στο gameslife.gr"
Ομιλία της CMO της Tenebra Studios Κωνσταντίνα Μπεθάνη στο Συνέδριο "Εθισμός και Διαδίκτυο Χρήση των Νέων Τεχνολογιών: κίνδυνοι και προκλήσεις"
Η Tenebra Studios στον Alpha TV και την εκπομπή Σαββατοκύριακο με το Μάνεση με αφιέρωμα στο πρώτο Ελληνικό VR Horror game ''Η Δούκισσα της Πλακεντίας'' από το δημοσιογράφο Γιάννη Μούτσο. Ευχαριστούμε το New York College για την ευγενική παραχώρηση του χώρου για την πραγματοποίηση των γυρισμάτων, το Avgikos Journal και τον Vaggelis Dagres Photography για τα γυρίσματα εντός του Μεγάρου Δουκίσσης Πλακεντίας, τον Andreas Mikro με το Drone Hellas για τα εξωτερικά γυρίσματα στην Πεντέλη, τον Λευτέρη Κοντουλάκο, Δημοτικό Σύμβουλο Πεντέλης και το Σύλλογο Φίλοι Μεγάρου Δουκίσσης Πλακεντίας για την πολύτιμη βοήθειά τους. 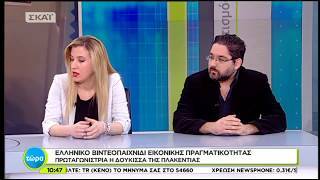 Tenebra Studios on Alpha TV and the TV show with host Nikos Manesis with a tribute to the first Greek VR Horror game "The Duchess of Plaisance" by journalist Yannis Moutsos. We would like thank New York College for kindly letting us use its premises for filming, Thanasis Avgikos and Vaggelis Dagres Photography for filming in the Mansion of the Duchess of Plaisance, Andreas Mikro with Drone Hellas for the outdoor shooting in Penteli, Lefteris Kontoulakos, Pendeli Municipal Councilor and the Association of Friends of the Duchess of Plaisance's Mansion for their valuable help. Η Κωνσταντίνα Μπεθάνη και ο Θανάσης Γεωργούλης, ιδρυτές της Ελληνικής εταιρείας ανάπτυξης βιντεοπαιχνιδιών Tenebra Studios και Καθηγητές Game Development στο IEK New York, μέλος του εκπαιδευτικού ομίλου New York College, παρευρέθησαν στην εκπομπή ''Τώρα''. Ευχαριστούμε θερμά την κα Άννα Μπουσδούκου και τον τηλεοπτικό σταθμό SKAI.gr για την πρόσκληση και την ευκαιρία να παρουσιάσουμε το πρώτο Ελληνικό VR Horror βιντεοπαιχνίδι ''Η Δούκισσα της Πλακεντίας''. Konstantina J. Bethani and Thanos Georgoulis, Tenebra tudios game development company founders and Professors at Game Development course at New York College educational group, attended ''Tora'' TV show. 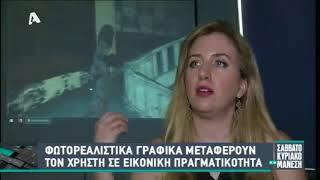 We would like to thank Mrs. Anna Bousdoukou and SKAI TV station for their invitation and the chance to present the first Greek VR Horror game ''The Duchess of Plaisance''. Tenebra Studios' "Duchess of Plaisance'' mocumentary with Thanasis Avgikos and Vaggelis Dagres Photography along with Drone Hellas. The first Greek VR Horror game, based on a true story, is coming. Special thanks to Lefteris Kontoulakos, President of the Friends Association of the Duchess of Plaisance' Mansion and Penteli's Municipal Councilor. 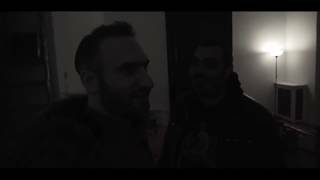 Konstantina J. Bethani and Thanos Georgoulis from Tenebra Studios along with Thanasis Avgikos talk about the first Greek VR Horror game, "The Duchess of Plaisance'', at Mad TV and Loca Report show with Ilenia Williams. 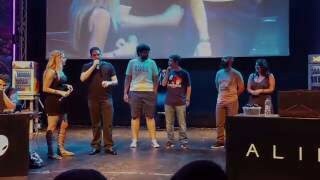 Tenebra Studios' Digital Expo and Athens Games Festival Recap Presenting "The Duchess of Plaisance", the #1 Greek VR Horror game. Thanks to John Vassiliadis for doing the awesome montage! 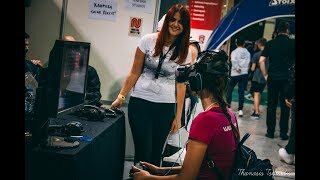 This is the recap of Tenebra Studios' presence at Digital Expo 2018, the biggest gaming and technological event in Greece, co-organized by the game development company. 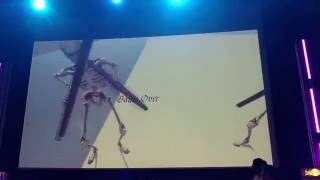 We would like to thank Thanasis Tsiftsidis Photoshoots for the awesome video! 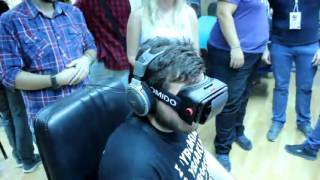 Tenebra Studios' presentation of Dungeons'n'Disco Pre-Alpha Demo v0.3 and the first Greek VR Horror game for Google VR, all in the great Gameathlon 3.5 2016. Many thanks to our dear friend Stathis Kalamoukis for recording the HD Video of the presentation. More info on Dungeons'n'Disco can be found on its official Gamejolt Page You can download the latest version from there as well and test it on your pc. The latest VR demo will soon be uploaded on Gamejolt as well. Follow un on Facebook to stay informed on everything Tenebra! 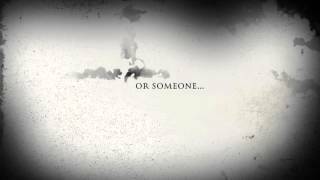 The Teaser #1 of the first Greek VR Horror game "The Duchess of Plaisance" by Tenebra Studios. The Duchess of Plaisance finally got her voice by Maria Zervou, famous Greek voice actress in an awesome sound recording session. Unboxholics VS "The Duchess of Plaisance" by Tenebra Studios Round #1 Thanks to Babis Matsamakis from Unboxholics for trying out "The Duchess of Plaisance", the First Greek VR Horror game made by Tenebra Studios. 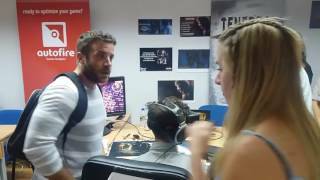 Alexandros Kondopidis from YouUp.gr and Unbox Office tried out the first Greek VR Horror game the "Duchess of Plaisance" by Tenebra Studios! Thanks for the support Alex! Alexandros Kondopidis and John Boursi from YouUp.gr and Unbox Office tried out the first Greek VR Horror game the 'Duchess of Plaisance' by Tenebra Studios! Thanks for the support guys! Tenebra Studios demonstrated the demos of its games currently under development, namely "Duchess of Plaisance", the 1st Greek VR Horror game and the FPS Dungeon Crawler "Dungeons'n'Disco", at Digital Universe #3 hosted by New York College. 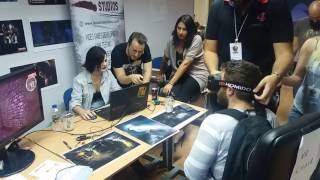 Tenebra Studios' members were interviewed by Greek Youtuber Dragoman AKA Manos Boubousis during Digital Expo 2017, where the new demo of the 1st Greek VR Horror game "Duchess of Plaisance" was presented. The interview is in Greek. 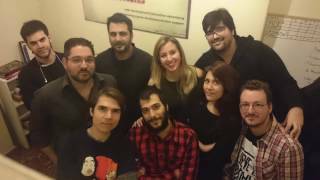 Η Tenebra Studios παραχώρησε συνέντευξη στον Youtuber Dragoman ΑΚΑ Μπουμπούση για το πρώτο Ελληνικό VR Horror game ''Η Δούκισσα της Πλακεντίας'', το νέο demo του οποίου παρουσιάστηκε στα πλαίσια του Digital Expo 2017. 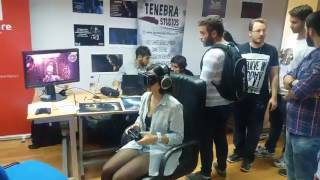 The first Greek #VR #Horror game "Duchess of Plaisance" made by Tenebra Studios was demoed at Digital Universe #3 hosted at New York College Kallithea and (too) many visitors tasted the fear. 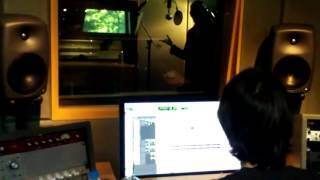 Tenebra Studios with New York College and Gamespace.gr: making of promo video. 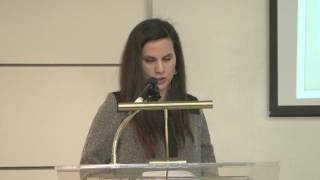 Tenebra Studios' CMO Konstantina Bethani participated at NYC Conference ''Internet Addiction: Dangers and challenges of new technologies'' where she gave a speech on the following topic: "From Demonization to the Right Use of the Internet". In addition to the games they develop, the founders of the company, Thanos Georgoulis and Konstantina Bethani, are employed as Professors at the Game Development Course of New York College educational group and have a track record of research projects. Made by Tenebra Studios Designed by MageeWP Themes.